I recently photographed the 1,300 megapixel panorama above and I decided to share some of the planning I did from home before taking the photo. I’ve been testing a new 3D virtual reality (VR) feature of PlanIt! for Photographers for several weeks now, and it is now publicly released. It uses digital elevation models (DEM) collected by the 2000 Shuttle Radar Topography Mission (SRTM) to provide very accurate 3D topography maps of the world. 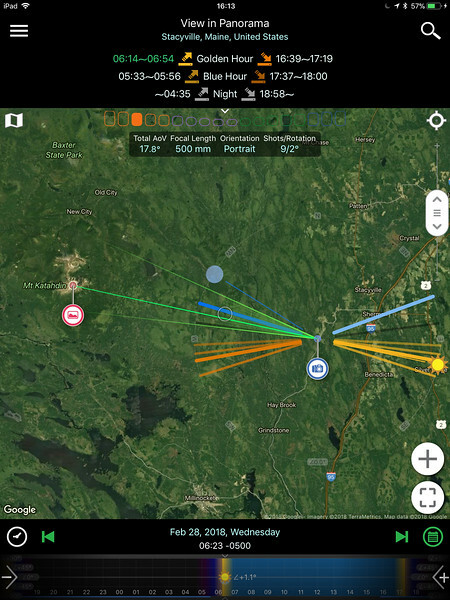 We can use this data for all sorts of detailed planning today with smartphone apps both at home and in the field. Here are some screenshots of the planning that went into the above gigapan so you can see how close the virtual reality view was to the real image! PlanIt! is a very complicated app with a lot of very advanced features. 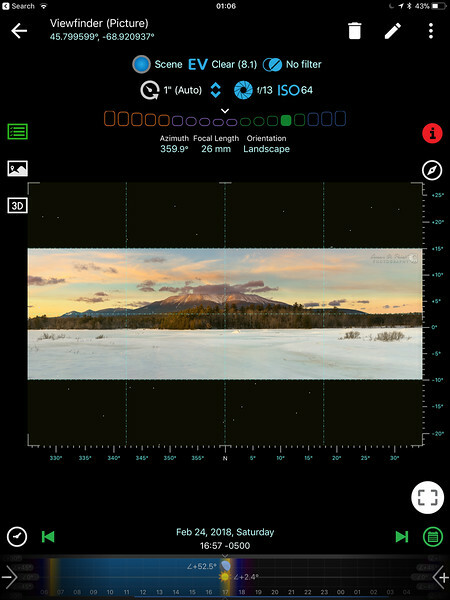 I’m only going to share a few of the tools with screenshots that I used to plan and shoot my panorama. It’s well worth reading the User Guide and watching the video tutorials to get the most out of the app. In the above screenshot I’m using the Special Hours page where you can see the times of Golden Hour, Blue Hour, and Night. At the bottom is the date and time when I took the panorama. You can see Golden Hour highlighted in green as it was within that time frame. 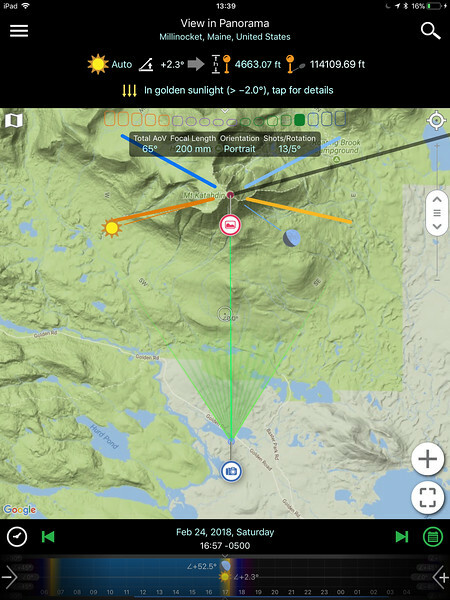 The map in the middle area is Google Terrain Map. There are two pins, the scene location where I chose Baxter Peak on Mt. Katahdin and the camera location on the edge of River Pond along the Golden Road. The distance between the two pins is 7.24 miles with an elevation gain of 4,663.07ft or +7° angle. The compass heading is nearly perfectly due north at 359.8°. I switched to the Light and Shadow page with the Panorama tool. 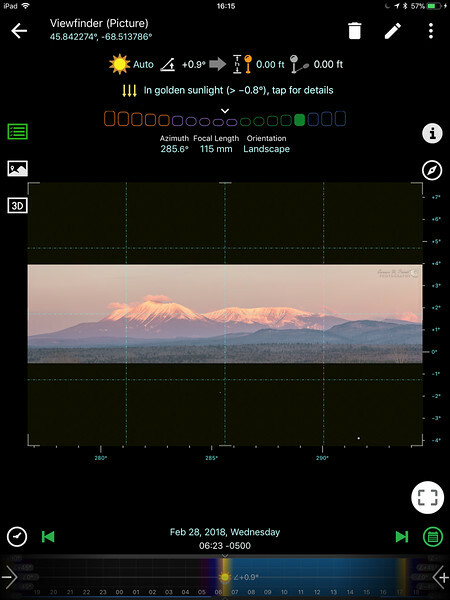 You can see that the mountain with a height of 4,663.07ft is still in golden sunlight with the sun 2.3° above the horizon, and is casting a shadow a distance of 21.6 miles to the northeast! 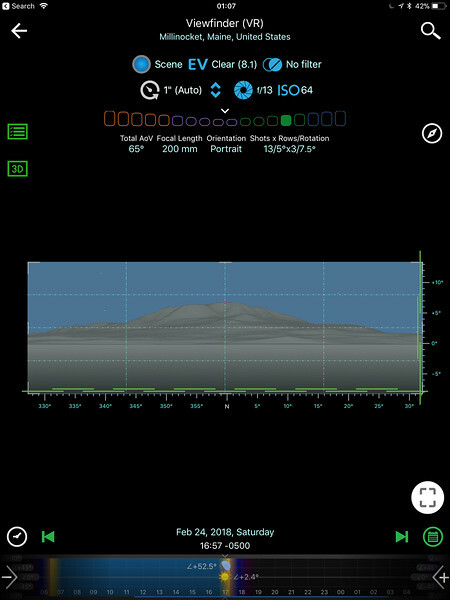 With the panorama tool, I settled on a horizontal angle of view of 65° to cover the entire width of the mountain range from that distance (the green “fan” from the camera pin). The focal length doesn’t matter yet, I can change that to anything I want in the next screen. Here I’m on the Exposure page in the VR viewfinder mode with the Panorama tool. I’ve already chosen a 3:1 aspect ratio for the panoramic view (by clicking the Shots x Rows/Rotation field), and I’ve already chosen a horizontal angle of view of 65° that covered the mountain range in the previous screenshot. Now I can choose the focal length I want to use and the app will tell me how many images will be required to shoot a panorama with the chosen angle of view and aspect ratio, in this case 13 columns by 3 rows for a total of 39 images. It also tells me what to set my click-stop rotator to, turning 5° horizontally and 7.5° vertically for every shot. I could have chosen 400mm and it would have effectively doubled the amount of photos for the same scene. I settled on 200mm because of the fleeting light at sunset, and I knew I was going to have to do some focus stacking too for the foreground. Clicking the 3D button shows a very realistic virtual image of the scene based on the DEM data I mentioned earlier. The red dot at the top of the mountain is the scene pin I set in the first screenshot. How accurate is the 3D VR scene? Check the next screenshot! I’ve loaded the finished panorama after stitching into PlanIt! with the Picture viewfinder mode. I haven’t cropped the image, only trimmed away the white borders after stitching. I shot a grid of 13 columns and 3 rows and it was very, very close to the 3:1 ratio that the app had predicted for a 65° horizontal angle of view at 200mm. I’ve changed the focal length to 26mm because the resulting panorama had just slightly more angle of view at 69°, and that’s the focal length one would need to shoot the scene with one image. Choosing the projection type in PTGui Pro when stitching probably stretched the image slightly. The sun lit up the mountain and foreground at this time just as predicted, but I had to shoot those parts of the scene first as the sun set very quickly! Here are my two pins: the scene location set to Baxter Peak on Mt. Katahdin and the camera location set to a field in Stacyville 20.07 miles away on the Google Satellite map. The compass heading is 282.5° northwest, and the elevation gain is +2.5° between the two pins. At the bottom is the date/time I took the panorama, during Golden Hour so it is highlighted in green. I’ve switched to the Panorama tool under the mode button and decided on a 17.8° angle of view to cover the mountain range. Enabling the VR viewfinder mode and pushing 3D gives me a virtual panorama. At a 500mm focal length in portrait orientation for 1 row of photos it will require 9 images, rotating every 2° on my click-stop rotator. 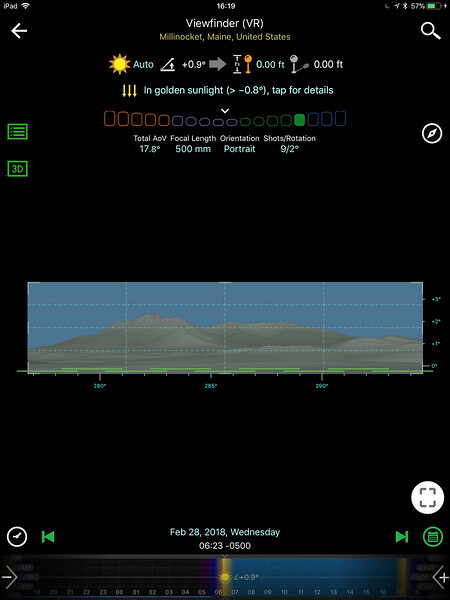 The Light and Shadow page shows that the sun is +0.9°above the horizon and the mountain is in golden sunlight. 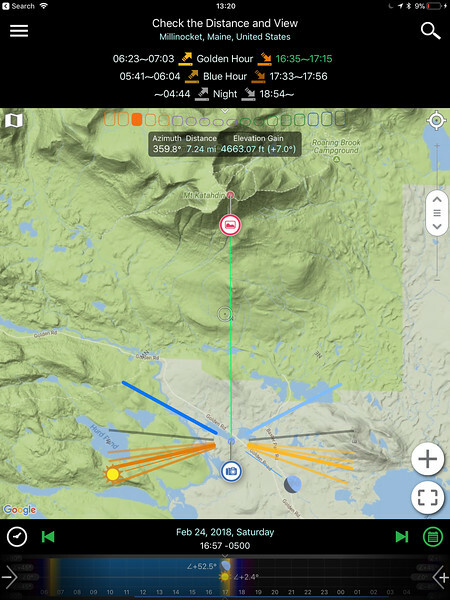 I changed my azimuth or compass heading slightly to 285.6° so my scene pin (the red dot at the peak of Mt. Katahdin) is no longer centered in the frame. VERY close! So close in fact that my tripod was probably slightly off bubble and that’s why the right side is slightly off in elevation. Let’s have some fun and see what else we can do! I switched to the Sun/Moon Finder page and drew a box above the mountain where I’d like to shoot the full moon. Here is one of three results for the year, which would have been the next morning but a snow storm prevented us from shooting it. It would have required a composite anyway as the moon appeared during blue hour when the sun was -6.2° below the horizon and the mountain would have still been quite dark. There is one time per year in the fall when it will happen during golden hour with the sun +1.9° above the horizon and I can re-capture this same scene with a full moon and autumn colors, but I’m keeping that date/time a secret and you’ll have to scout your own epic panoramic scenes! Check out the Overview chapter of the PlanIt! user guides on their home page to learn how to download SRTM data for offline use and plan your own shots.